Shumen (also spelled Shoumen or Šumen, Bulgarian: Шумен), is the tenth largest city in Bulgaria and the administrative and economic capital of Shumen Province. The city was first mentioned as Šimeonis in 1153 by the Arab traveler Idrisi. The name is probably from Bulgarian shuma '(deciduous) forest', though some believe (Konstantin Jireček) that it comes from the name of the Bulgarian emperor Simeon the Great. In the following periods, the city was mentioned with different variants, such as Şumena, Şumna, Şumular, Sumunum, Şumnu and Şumen. Earliest reports for Shumen fortress date back to the early Iron Age. From the 12th century BC is the first fort, surrounding accessible parts of the area. Archaeological surveys, conducted in 1957, 1961 to 1987, determined the chronological periods, the lifestyle and the livelihood of the inhabitants of the fortress. It had a wall thickness of about two meters, built of rough stones. In the 5th century BC second wall was built in front of the former. 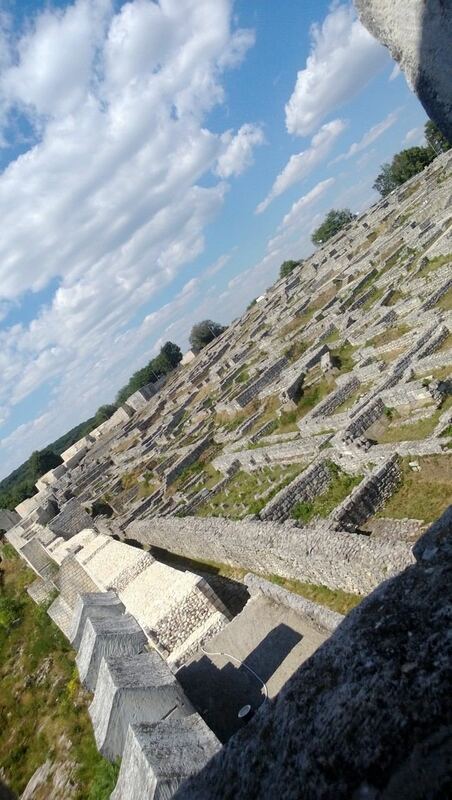 In the 2nd century the Romans built a military fortress on the ruins of the Thracian fortifications. The construction of the wall is already bonded to mortar; a tower was constructed above the gate; square tower was built to the west and semicircular to the south. In the 4-5th centuries the entire hill was fortified with a new wall with nine towers. Between the 8th and the 10th century the fort was renovated, for the purpose the Roman wall and towers were used and to the northeast was built a new wall with two towers. In 681 khan Asparukh incorporated the territory into the First Bulgarian Empire. In 811 Shumen was burned by the Byzantine emperor Nicephorus and he was killed at the Battle of Pliska, when khan Krum of Bulgaria encased Nicephorus's skull in silver, and used it as a cup for wine-drinking. The Bulgarian fortification of the 7-10th centuries developed into a feudal city with castle with surrounding inner and outer defensive zones, in which can be counted 28 towers and bastions, three gates and five small porticoes, with many churches and workshops (12th to 14th century). During the golden age of Bulgarian culture under Simeon the Great (893-927), Shumen was a centre of cultural and religious activity, and may have borne the name Simeonis. During the Second Bulgarian Empire, Shumen was a significant military, administrative and economic center, displacing even the old Bulgarian capital Preslav and developing outside the fortress. In the medieval city of Shumen the main religion was the Orthodox Christianity, evidence of which were the found in the outline of the walls seven churches, commemorative coins with the image of crosses, angels and the numerous findings of Orthodox crosses separately, as well as their image on rings and on other artefacts, found in the graves and the homes. Change occurs only after the Ottoman conquest of the city in the 15th century, when Islam was introduced. In 1388 the sultan Murad I forced it to surrender to the Ottoman Empire. After Władysław Warneńczyk's unsuccessful crusade in 1444, the city was destroyed by the Ottomans and moved to its present location. In the 18th century it was enlarged and fortified. Three times, in 1774, 1810 and 1828, it was unsuccessfully attacked by Russian armies. The Turks consequently gave it the name of Gazi ("Victorious"). In 1854 it was the headquarters of Omar Pasha and the point at which the Turkish army concentrated (See Crimean War). During the 19th century Shumen was an important centre of the Bulgarian National Revival, with the first celebration of Cyril and Methodius in the Bulgarian lands taking place on 11 May 1813 and the first theatre performance. A girls' religious school was established in 1828, a class school for girls and a chitalishte (community centre) followed in 1856. The first Bulgarian symphony orchestra was founded in the city in 1850. In the same year, influential Hungarian politician and revolutionary leader Lajos Kossuth spent a part of his exile in the then-Ottoman town of Shumen. The house he lived in is still preserved as a museum. On 22 June 1878 Shumen finally capitulated to the Russians and became part of the newly independent Bulgaria. In 1882 the Shumen Brewery, the first brewery in Bulgaria, was founded. In the period 1950–1965 the city was called Kolarovgrad, after the name of the communist leader Vasil Kolarov. 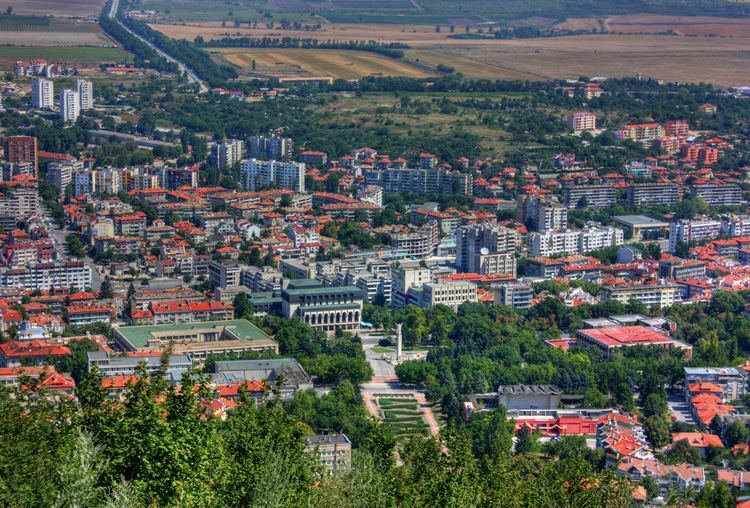 The city lies 80 kilometres (50 miles) west of Varna and is built within a cluster of hills, northern outliers of the eastern Balkans, which curve round it on the west and south in the shape of a horse-shoe. A rugged ravine intersects the ground longitudinally within the horse-shoe ridge. From Shumen roads radiate northwards to the Danubian cities of Rousse and Silistra and to Dobruja, southwards to the passes of the Balkans, and eastwards to Varna and Balchik. In January 2012, Shumen was inhabited by 80 511 people within the city limits, while the Shumen Municipality with the legally affiliated adjacent villages had 93 160 inhabitants. The following table presents the change of the population after 1887. The number of the residents of the city(not the municipality) reached its peak in the period 1990-1991 when exceeded 110,000. Shumen is part from Varna and Veliki Preslav diocese.Shumen is a center of Shumen spirit district.Around 15% of the population of the town are Muslims. FC Shumen 1929 is the local football club since 2013, and the financial failure of PFC Shumen 2010. The club uses the Panayot Volov Stadium as its home ground. Basketball, volleyball and handball are also represented, and most of the games are held at the Mladost sports centre. Other sporting activities include martial arts (mostly karate) and horse racing. Shumen has its own rallying tournament, the Stari Stolitsi. The Madara Horseman, a World Heritage Site and an only such example of medieval rock art in Europe, is an ancient (710 AD) monument usually attributed to the Bulgar culture, and lies some 20 km (12 mi) from Shumen. The religious buildings in the city include the Eastern Orthodox Holy Three Saints Cathedral and Holy Ascension Basilica, as well as the Sherif Halil Pasha mosque (also known as the Tombul Mosque), the largest mosque in Bulgaria and one of the largest in the Balkans, serving Shumen and the region's Muslim minority. Shumen Peak on Livingston Island in the South Shetland Islands, Antarctica is named after Shumen. The tails of the Bulgarian currency lev are the same as the seal of Shumen, showing the Madara Rider, 15 km (9 mi) away from the city.